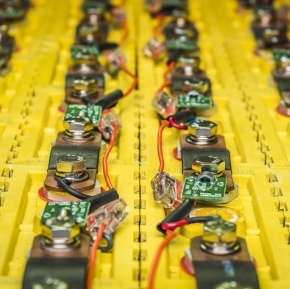 Axion has announced its new partnership with Aspire Engineering Ltd and Aceleron, to focus on reusing and recycling the growing volume of batteries used in electric vehicles and light automotive applications. The resource recovery expert has teamed up with Aspire Engineering Ltd, a specialist in sustainable circular economy Remanufacturing, Reuse, Recycle engineering and manufacturing solutions provider, and Aceleron, a lithium-ion battery reuse specialist. Together, the companies will tackle the growing market of electric vehicle battery systems at the end of initial life, and address the large number of cells from end-of-life portable electronic equipment. With over 100,000 end-of-life batteries in the UK needing to be recycled or reused, the three companies together will offer a full service for end-of-life lithium-ion batteries that will address the previously complex, expensive and energy-intensive issues associated with recycling these types of materials. The service will see batteries be processed for remanufacturing, reuse and recycling by Aspire; tested and repurposed for second-life applications by Aceleron; and recycled by Axion. Aspire’s Managing Director, Ian Briggs said: “This venture brings together a strategic alignment of three companies which have the same goal and same environmental and sustainable ethos. This connection is bound by morals for a cleaner environment and a sustainable future. Axion is now a partner in the CALIBRE project, a collaboration between Johnson Matthey, Autocraft Drivetrain Solutions, Benchmark Mineral Intellegence, Nissan, and WMG at the University of Warwick to demonstrate a UK-based supply chain for end-of-life batteries. Meanwhile Aspire and Aceleron are members of the VALUABLE project, which looks at a battery remanufacturing business solution, technical processing methods and capital investment cost requirements for setting up a battery system remanufacturing facility.